Grant Stanton Smith is a second generation Miami native of partly Cuban heritage. He graduated from Gulliver Preparatory in Miami in 2004 and thereafter attended DePauw University in Indiana where he graduated in 2008 with a B.A. degree in English Writing and a minor in Spanish Language. 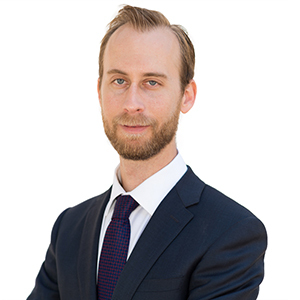 Upon graduation, Grant returned to Miami and enrolled at Nova Southeastern University, Shepard Broad Law Center to pursue a juris doctor degree with a concentration in international law. During the course of his studies Grant spent several months in Africa, working at the Tanzanian Women and Children Welfare Center in Dar es Salaam, Tanzania, handling divorce and child custody cases. In 2012, Grant was awarded a J.D. degree with a concentration in International Legal Practice and was admitted to the Florida Bar that same year. Grant thereupon accepted a position with a prominent regional Latin American law firm, Vivanco y Vivanco, working at its head office in Quito, Ecuador. The primary focus of his practice in Quito was in assisting North American Fortune 100 companies conducting business in the country, and helping them in negotiating the administrative requirements of the many Ecuadorian government ministries. In 2014, at the firm’s request, Grant moved back to Miami to open their first North American branch office. For the next two years, Grant served as the sole Director of the Miami office, where his prime focus was on aggregating talent to help represent a wide array of Latin American entrepreneurs and multi-generational family businesses, either entering the U.S. market or involved in litigation in North America. In that position he was involved in a broad range of legal issues, often working with lawyers from other jurisdictions. Such issues included mergers and acquisitions, corporate start-ups, international asset protection, offshore incorporation, international asset tracing, commercial litigation, and procuring evidence for foreign proceedings under 28 U.S.C. §1782. Having developed a solid grounding in the general practice of international law, Grant decided to concentrate his focus on international dispute resolution and in 2016 he accepted AMK’s invitation to add his multicultural and multilingual skills to the firm’s international litigation team. Carbon Emissions—An Introduction to What’s Making the World Trade Organization Sweat, The International Law Quarterly, Summer 2014. Commencing Litigation Against A Defendant with International Ties? Not So Fast- an Introduction to an International Approach to Domestic Litigation, Florida Bar Journal, January 2017.